Fall is a time when nature is at its best with bright foliage covering the roads and the cool wind giving you the whiff of approaching winters. Its a transition period and with this change in the weather, possibilities of your pet falling sick due to allergies and parasites like ticks and fleas increases multifold. Other than that, there are several things that pets may need to be safeguarded from in this second, festive half of the year. Flea and ticks don’t just lurk in the summer season; they can infest your pet in this transition period as well. Grasses and leaf piles can be the hiding places for ticks and crawl up to your pet’s body while he walks on them. It is therefore important that your pet is safeguarded no matter where you go. Flea and tick preventatives come in different forms like topicals, sprays, chews, and collars having varying efficacy levels and performance time. Some may be monthly whereas some others can work for 3 months. Autumn is the most favorable period for fungus like poisonous mushrooms. Many regions experience rain and thus the damp places make the area suitable for mushrooms. Though not all of them are toxic, even one poisonous mushroom can damage liver and kidney in pets. Thus it is better to keep your yard clean where mushrooms can grow easily and avoid taking your pet to the damp places. As the temperature cools down, rodents come out from their holes in search of warmth and thus can be easily noticed in the autumn. Due to the same reason, some people might use rodenticides to repel rats from entering or wandering around their house. However, you must be careful while storing them because they are highly dangerous for pets and can lead to fatal consequences if ingested mistakenly. So, make sure you hide them away from your pet’s reach. Antifreeze has a sweet smell which may attract cats and dogs. It is thus important to keep it away from your pet because the ethylene glycol in it is extremely toxic for pets if ingested mistakenly. Even a small amount can lead to lethargy, extreme thirst and kidney failure in pets. In case, your pet ingests antifreeze mistakenly, take him to the vet hospital immediately. Antifreeze is a poison for them and thus you need to very cautious while storing antifreeze in your house. Always make sure it is not accessible to pets at any point in time. Use it in their absence. Seasonal change and strong winds can cause dryness of the skin in dogs and cats which leads to scratching and biting. You must use moisturising products like essential 6 for keeping his skin smooth and soft. 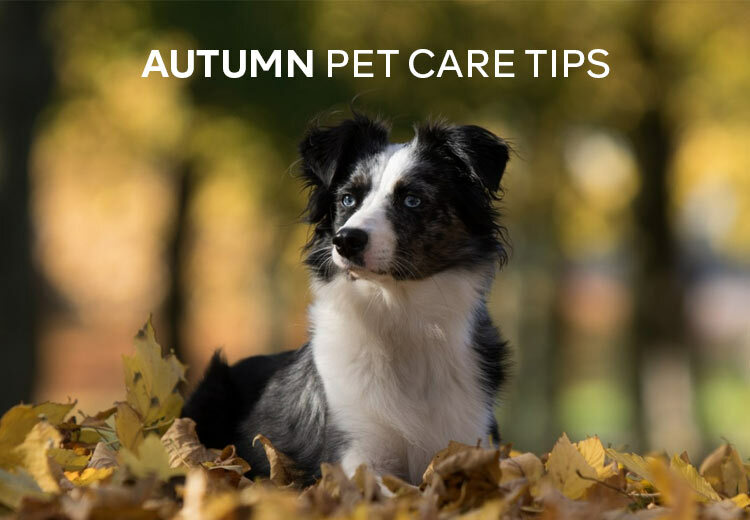 Some dogs may also suffer from respiratory issues like coughing, sneezing, nasal discharge and red, watery eyes during this season because of the pollens, grass and mold spores in the wind. Thus, it is better to stay indoors most of the times and if at all the pet shows signs of allergy, consult your vet for medical help. A balanced diet increases immunity and increases physical strength. Pets that are fed more nutritious diet develop good immunity and thus don’t fall sick because of the seasonal changes that easily. Moreover, as the temperature goes down body needs more energy to function properly so make sure he eats all his meals properly and on time. You can also feed supplements to enrich his diet and boost his nutrition. Most of the people bring chocolate candies and sugar-coated stuff for Halloween celebrations. Completely avoid giving this stuff to your pets. Do not involve him while you feast on those munchies as sugary stuff can cause diarrhea, vomiting and other complications in animals. Autumn can prove to be a very amazing season for you and your pet if you take proper precautions in advance. Make sure you follow these guidelines to let your pet safely sale through this transition period.